A solid wood Amish Bathroom Vanity can meet your needs from both a practical and decorative perspective. We offer numerous single and dual vanities loaded with functional features such as dovetailed drawers, expansive storage compartments with adjustable shelves and pre-drilled holes to accommodate your faucet fixtures. 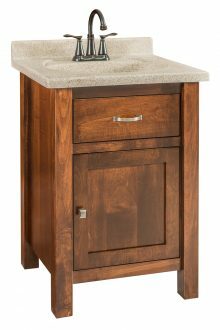 You’ll also appreciate the timeless elegance that a Mission- or Shaker-style vanity will bring to the appearance of your bathroom. Thanks to a wide range of styles and sizes, you can find an Amish bathroom vanity that fits in just about any bathroom. Choose a narrow, compact single vanity for your small washrooms and a wider, more spacious double vanity for your large bathroom. You can customize your solid wood vanity by choosing the type of wood, the stain and the ceramic bowl color. That means no matter what your décor may be, your solid Amish bathroom vanity will fit in perfectly. If you’re remodeling your bathroom, you can plan to add other great pieces of Amish furniture and accent pieces to get a stylish, elegant look. 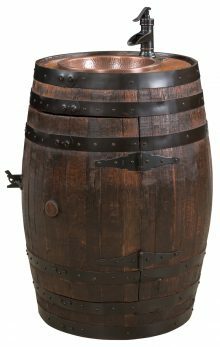 AmishOutletStore.com is renowned for offering made-to-order Amish furniture that meets our customers exact specifications. We give you the opportunity to choose from a wide range of hardwoods such as oak, cherry and maple, as well as numerous additional features such as granite and Corian counters and ceramic bowls in various colors. Use the fun, convenient online design tool on every product page to create your own customized bathroom vanity. Skilled Amish artisans will then bring your design to life. 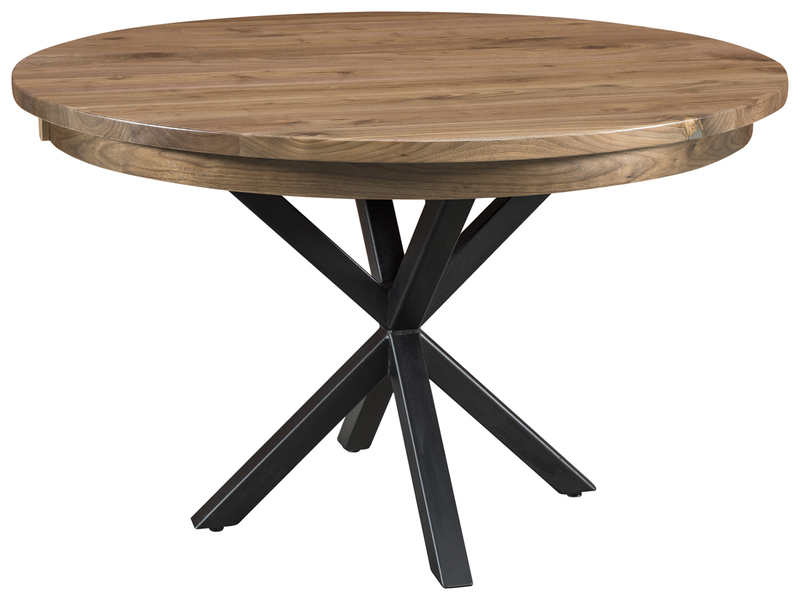 It’s built close to home by hardworking Amish artisans according to their time-honed traditions — instead of in factories in overseas countries that pump low-quality look-alike furniture off an assembly line. Amish artisans choose only solid Northern kiln-dried hardwood and never use pressboard or particle board. All hardware is top quality as well, with no cheap plastics used anywhere. Every piece of wood is chosen according to the beauty of the natural grain, so the end result is a harmonious look and finish for your bathroom vanity. The finishing stain is not only there to look good — it also helps seal and protect your bathroom vanity against humidity, so years from now it will still appear brand new. Cheap modern mass-produced bathroom furniture can absorb moisture over time and start to crack and peel. You don’t want to be replacing your bathroom vanity in a few years, so opt for the Amish hardwood solution that will be part of your bathroom for a very long time. Minimizing expenses is important when purchasing a bathroom vanity, especially if it’s part of an extensive bathroom remodeling project. With the wide range of discounts available at AmishOutletStore.com, you can be sure your vanity will fit your renovation budget. Purchase your vanity today, and we’ll give you up to 33% off the regular retail price! You can also save as much as 13% on large orders. 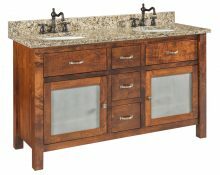 Check out our current selection of more than two dozen solid wood single and dual bathroom vanities and order the one that’s right for your home today! Many of our Amish bathroom vanities are part of larger bathroom furniture collections, so take a look through our catalog and find all of the other accents and accessory pieces you want. You can choose the same wood and finish for all, or mix-and-match if you want a more eclectic décor in your bathroom. One popular style these days is taking old doors and window frames and installing mirrors, shelves and towel racks to decorate your bathroom. This classic style matches perfectly with our traditional Amish solid wood bathroom vanities, and it can really bring the room together. 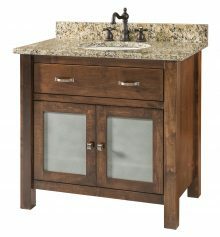 Get started right now customizing your vanity here at AmishOutletStore.com, or give us a call if you have any questions. We’d be more than happy to give you any pointers and help you create the perfect bathroom vanity. Maybe you know which hardwood you prefer, or maybe you want to know a bit more about the different types of wood we use. 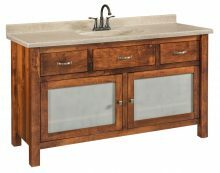 We want you to be confident in the solid wood Amish vanity you’re choosing because we know what a pleasure it is when your new vanity is in place. You will be able to step back and admire the traditional beauty and craftsmanship that went into it.